A few hours remain before the start of the first hardest race kilometer of gravel track of Ukrainian Rally "Aleksandrov Rally". This year, Chernivtsy region also receives XII European Rally Cup and VI stage of the Russian Championship. For the first time in the history of Russian Championship the race held on the territory of Ukraine, and to the attention of our fans will be offered the unprecedented intriguing fight – the drivers of both Championships will be fighting for the title of quickest at breakneck Carpathian roads. Today a test session had been completed – all participants had to drive a real stage in a trial mode to test all of its features expecting a race tempo in the next two days. The special stages of Aleksandrov Rally promises a tough test for the racers – organizers have provided new combat segments along with now traditional special stages. 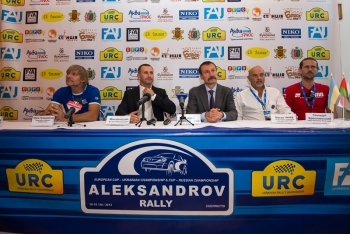 "The special stages that we all go in the rally for the first time, will be quite a test for all participants – Valeriy Gorban, the leader of Ukrainian Rally Championship commented on the upcoming event. – The new segments of kickers and jumps resemble Finland, one of the iconic races of the world". There is a hot battle for the Absolute Champion title in Ukrainian Championship, in which "Aleksandrov Rally" sure to bring a special intrigue. However, not less attention of Ukrainian fans will be riveted to our guests – this time Chernivtsy witness the start of the strongest crews of Russia. "In this rally one can not go blindly – shared his impressions of the track the leader of the Championship of Russia, Gennadiy Broslavskiy. – The tracks here are some that will give drivers the highest level of fun and we look forward to the launch". Andrey Zhigunov, the legendary Russian pilot agrees with his colleague: "At every race all are out to win, and we will do our best to adequately perform on this stage. We are honored to be here today and we will be happy to start on this challenging, interesting, and a completely new roads for us. Well, the results should be discussed at the finish". Of course, this international festival of motorsport would not be possible without the support of the local authorities – of the most serious prospects of Chernivtsi stage had been told by the Head of the Chernivtsi Regional State Administration, Mr. Mykhailo Papiev, and the Secretary of the Chernivtsi City Council Mr. Vitaliy Mykhailyshyn. And present at the press conference Mr. Metin Ceker, head of Chairman of the Stewards representing Automobile Federation of Turkey stressed that the level of "Aleksandrov Rally" fully corresponds to its high international status. Let us remind that on Saturday and Sunday participants will overcome 180 kilometers of special stages and will make certain the fate of titles in all scoring categories of the Championship of Ukraine and Russia.